Northeastern University scuba divers inspect an invasive seaweed, heterosiphonia japonica, along the coast of New England this summer in this photo provided by Chris Marks of Northeastern. More of the seaweed was found at Crescent Beach in Cape Elizabeth in October by South Portland High School students. CAPE ELIZABETH, Maine — An invasive species of seaweed is rapidly moving north and recently was found on the town’s shore by South Portland High School students. Researchers are concerned the plant will dominate native seaweed and other plants. It also might turn into a nuisance for lobstermen, if it gets caught in their traps, and for beach-goers, who may notice its stench when it washes ashore. 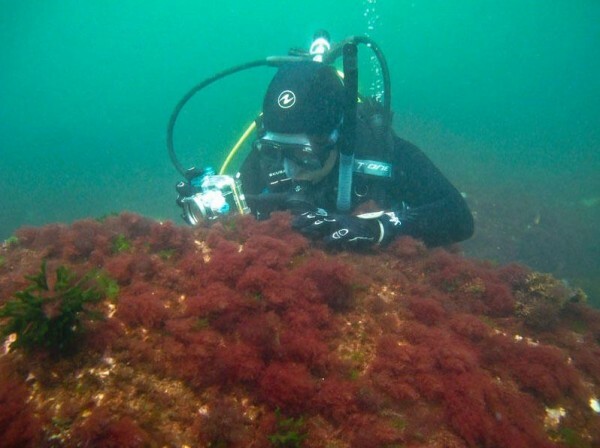 The finding in Cape Elizabeth is the first sighting on a shore in Maine of the red Asian seaweed, Heterosiphonia japonica, although Northeastern University researchers in Boston also documented it during the summer while diving off the coast. In October, students found the seaweed during a marine biology class where they were tasked with finding 11 different species of seaweed at Crescent Beach. The students returned to the lab with the different sets of seaweed they had gathered and put them under a microscope. They found that one of the species was dramatically different than the native species and posted their findings through the Gulf of Maine Research Institute’s Vital Signs program, an online research platform aimed at locating invasive species in Maine. Their teacher, Susan Richman, has worked on projects with Vital Signs and directed the students to use the program to connect with interested scientists, said Christine Voyer, one of GMRI’s Vital Signs staffers. Matt Bracken, a marine biology professor at Northeastern who is leading the research on the species, took notice of the student’s observation and confirmed their suspicion by posting a comment on their page. Bracken said Cape Elizabeth is the farthest north they’ve recorded the seaweed. It has been found in several areas, including Fort Williams Park, Two Lights State Park and Kettle Cove. The seaweed, originally from Japan, invaded Europe in the 1980s, spreading for 800 kilometers along the Norwegian coast in less than five years, Bracken said. Although they don’t have enough evidence to show a causal relationship in places where the seaweed has been found, native species have declined, Bracken said. Researchers don’t know how long the species has been in New England, but they know it has worked its way up the coast, and in addition to Maine, has been found in New York, New Hampshire, Rhode Island and Connecticut. The first sighting of the seaweed was by chance. In 2009, a Connecticut biologist walking along the beach spotted the invasive seaweed on the shore in Rhode Island, Bracken said. “It was kind of a eureka moment when he found that it was even present,” he said, adding that it takes a well-trained eye to identify the seaweed as invasive because it looks similar to some of the native species. Finding the unwelcome marine algae is one thing, Bracken said; removing it is where things get difficult. Aside from human intervention, Bracken said the other possibility is to transplant herbivores to the area, such as sea urchins. But this is also difficult because the number of urchins in the area is low. Bracken’s group at Northeastern is preparing a publication about the species expansion to Maine and is partnering with other groups in Cape Cod and southern New England to study the species.